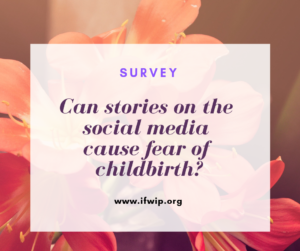 Opinion poll: Can stories on the social media cause fear of childbirth? Tocophobia is a common condition affecting about 14% women. Some recent media articles are discussing whether birth stories available on the social media can lead to a fear of childbirth. Please take part in this short survey and let us know what do you think? There is only one question in the survey and takes only a few seconds to complete. This is entirely anonymous and no need to enter your personal details. Yes of course it is potentially possible that social media could cause a fear of childbirth, but I think it is more to do with the appalling experiences women actually have when giving birth. Social media did not influence why I have a fear of childbirth, it was as a direct consequence of how horrific my first childbirth experience was. I wasn’t scared before this. Fears are everywhere , so therefore allow people to speak openly about their lived experiences of childbirth, and make sure those that have tocophobia have access to correct evidence based treatments which can allow them to become a parent. Apply to both sexes also. I answered yes because social media ‘can’ affect people in many ways including to induce fear of any situation . But social media ‘can’ also offer the solution too by providing the flip side stories and more context than just the focus on the bad situations. Awareness of both sides is important, not just the positives or negatives in isolation. I found the right social media groups to be extremely useful in giving me knowledge and empowerment to help manage my recent birth preferences and to feel empowered to challenge certain healthcare professionals on some of the recommendations they were proposing for me. I would say I was fearful of birth for many years. I read up from credible sources and learned a lot about why bad experiences happen. This allowed me to really manage my own situation and retain some control which helped reduce my anxiety. Hypnobirthing principles were central to this – it’s a shame people have the wrong idea about what hypnobirthing is- I know I did until I decided to challenge myself and read up on it. I would say potentially yes for some women. Maybe for those who are particularly anxious about delivery. I remember speaking to one lady who’s friend shared her difficult birth on their Watsap group and she was really upset about this and felt she shouldn’t have shared her story when she was still yet to have her baby. Some women are avoidant of even thinking about labour. Yet equally women will often say nobody told me it was going to be like this and feel underprepared. So I would say for others hearing positive and negative stories can serve as information and preparation on the realities of different experiences of labour. Thank you for sharing – I’ve completed the survey. Just one tiny correction though I think some fear of childbirth is common but not tocophobia. This is defined as morbid fear/ severe fear – phobic! With some women delaying/ avoiding pregnancy and/ or requesting operative birth to avoid labour and baginql birth. Tocophobia affects 10-16% of women (and occasionally her partner) depending which research you look at. Honestly no, childbirth causes fear of childbirth. It is normal to be afraid of excruciating pain, loss of control, humiliation and an objectively high potential for harm or even death of your baby or yourself. Despite huge advances in technology and medicine, birth is still the most dangerous day of an average person’s life before they reach late old age. To not fear it is pathological. Stories on the internet have served to remind people of the realities. If anything this is reducing instances of birth trauma which typically arise when women are inadequately prepared due to exposure to too many ‘positive’ or unrealistic portrayals of birth. If, before going on a long haul flight, I read articles and watched films about plane crashes and terror attacks I would probably have an anxiety-filled journey. If i’m pregnant and dont know what to expect, or had a traumatic first birth, and continue to watch dramatic, fear-enhanced childbirth drama, (you know what i mean) or read articles with snippets from “research” to suit the author’s theme…. Then guess what? Fear enhances fear. Why are there very less stories being told of positive, even pleasurable births? Our grandmothers and great grandmothers usually birthed babies at home without a second thought because that was their culture. It was the norm and birth was birth of a family and a celebration. I just heard Dr Michel Odent this week talk about how our culture, which is surviving on much less melatonin due to our gadgets and habits. Then how can we expect it, and oxytocin to magically work in labour? We need to rethink our lifestyles, language and what we read and watch, what we take into our hearts. Try turning your phone off when the sun goes down and keeping it in another room until the next day and see what happens to your anxiety, fear and sleep habits.